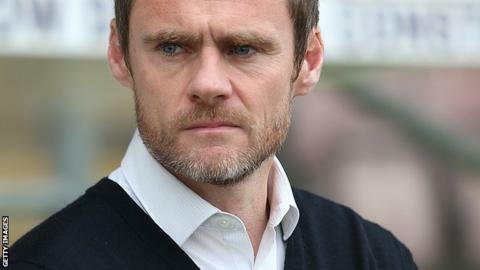 Manager Graham Alexander says Fleetwood will do their best to put pressure on Chesterfield in the race for promotion. The Cod Army trail the Spireites by three points and travel to the Proact Stadium for their final game on 3 May. "At this stage of the season, obviously Chesterfield's is the first result we look for," said manager Alexander. "We know that if we get the results, someone will drop points, but we can't control anything Chesterfield do until the last game." Fleetwood won 2-0 at Oxford on Saturday to close the gap on Paul Cook's Chesterfield, who drew 1-1 with Newport. Fleetwood Town and Chesterfield have met three times already this season. The league meeting at Highbury in October ended 1-1, while Chesterfield won 3-2 on aggregate in the two-legged northern area final of the Johnstone's Paint Trophy. Speaking to BBC Radio Lancashire, the 42-year-old continued: "We've got five games to go and we need to win as many as possible to give ourselves the best chance. "We want to get into that top three and we've got five big games to go. We have to make sure we earn as many points as we can before that and Saturday was a good step for us." Meanwhile, Alexander says on-loan midfielder Adam Barton will have to wait patiently for a first-team chance if his side continue their recent good form. The Northern Ireland international has yet to feature since joining from Coventry. "He came in and I thought it was too soon for him to come into the team or the squad," said Alexander. "Adam's another one that's going to have to compete to get into the team. We brought him in to add competition and that's what he's done. "We know Adam's qualities, but like we say to the players all the time, if they do enough to keep the shirt, they keep the shirt and I don't care who you are."